Super Mario Bros. 2 (Oct. 9, 1988) and Super Mario Bros. 3 (Oct. 23, 1988) both turn 30 this month. Both of these were among the earliest video games I ever played. I remember finding SMB2 to be very difficult as a kid (even playing as Toadstool), and I don't think I ever made it to any of the end-world bosses until I was older. I did enjoy searching for the warps that would take you to later worlds in the game. I also recall finding Phanto and Birdo to be terrifying. SMB3 was and is one of my favorite games ever. Me and my best friend would attempt to marathon the game (never beating it, though), and we would also draw our own custom world maps and levels. I loved the variety of the game's worlds; I think Giant Land was my favorite at the time. What're your memories with these games? When I was growing up, the SNES was the main source of entertainment. The NES was still around, and we would play Duck Hunt occasionally, but 95% of the time the SNES was what was hooked up. As such, my introduction to both of these games was Super Mario All-Stars. But already by the time I was born, Super Mario World was out, and my brother was obsessed with it (rightfully so). Most of my formative Mario years were spent learning all 96 exits and how to use the cape at its full potential. All-Stars was fun, but I couldn’t spin jump? What the heck? After running SMW thoroughly into the ground, though, I did start getting into SMB2 and 3. I preferred 2 during my childhood, and still have a massive fondness for it. It needs more recognition in the Mario canon, IMO, and anyone who says something stupid like “It’s not a real Mario Game, it’s just Doki Doki Panic!” needs to go sit in a corner and think about what they’ve done. SMB3 is phenomenal, though, there’s no denying it. I think the incarnation of SMB3 I’ve played the most was on the Wii Virtual Console. I never had that childlike “explore every single inch of every single level” drive with this game, though, so even last month when I played with Panfan, he was teaching me new secrets and hidden blocks I had never found. Ultimately, SMB3 deserves more of my life’s minutes than it currently has taken up. I’ve definitely played more SMB2 than 3, all-told, even though I think 3 is the better game in the end. (SMB2 still Top 10 tho.) SMB3 is also the game that I discovered my dad played in the 80’s, which threw me for a loop. I never knew my dad liked Mario until I was like 10 years old. I always assumed it was my older brother that got the family into video games, but it turns out it was my dad all along. That was crazy to me. I preferred 2 during my childhood, and still have a massive fondness for it. It needs more recognition in the Mario canon, IMO, and anyone who says something stupid like “It’s not a real Mario Game, it’s just Doki Doki Panic!” needs to go sit in a corner and think about what they’ve done. I don't think I ever realized these came out in the same month! The timeline is kind of funny. Yeah, it seems weird until you realize that our SMB2 never got a Japanese release. Throws off our normal concept of how games released in the 80’s and 90’s. ^ It actually did get a Japanese release... in 1992. Ah, yes, I knew that. Good call. 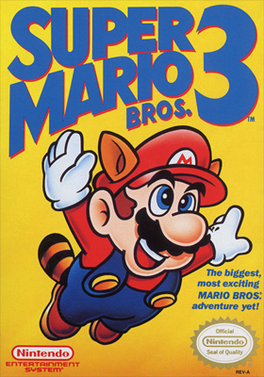 I had a long blog post way back in the old version of the forum about my memories of Super Mario Bros. 3. I hold it dear to me because my late granduncle used to own an NES. He was really into video games and the last console he owned was a PS2 (I think. . .I already forgot). The last time I ever saw him was when I was little, like 8 or 9. We always said we'd visit him but he lived in Long Island and my father didn't want to be bothered with the trip and the traffic (it's a long story - family drama). And then alas, my granduncle passed away. I never did get to play video games again with him. He had SMB3 as part of his NES collection. It was the first NES Mario game I ever played at the time, and so I found it really difficult. But every time I lost and I was like "Ugh" and just sat there with the controller he was like "What are you doing? Don't stop! PLAY THE GAME! You can do it!" That's awesome that he was pushing for you to beat SMB3 though. Sound's like a standup guy. I would expect nothing less from a fellow long islander. I grew up on SNES and Genesis with my family. Until I decided to just mow a bunch of lawns until I had enough for my own N64. That's where it all started for me.